We are the reputed Manufacturer, Exporters and Supplier of Athletic Starting Block. Athletic Starting Block is easily adjustable to permit the athlete to get the most beneficial starting position. Our Athletic Starting Block holds the feet at the start of a race so that the athletes dont slip as they push out while starting. 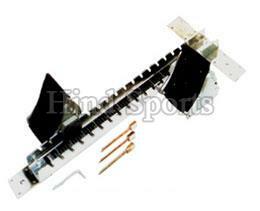 Our Athletic Starting Block is well designed by our experts to cater the need of the runner.